One of the best ways for packaged cigarette smokers to try roll your own products and procedures is to purchase a starter kit. These kits usually contain an injector, tubes, and tobacco and often a plastic case to hold the finished cigarettes. Some are nicer than others and all the brand name ones have the small hand held type of injectors whose performance is not up to the standards of the much more expensive Supermatics.There are a number of brand name kits out there (although it is not all that easy to find them all online) so let's list them first and then we can move on to the kits provided by various tobacco outlets that are put together using various bulk tobaccos and usually more sophisticated injection machines like CTC's line of Supermatics and the Excel. Let's start with the Zig-Zag starter kit. It comes in two sizes, one that will roll about 100 cigarettes (shown at left) the other, a larger one, creates about 200. We have been unable to find this kit online and suggest you shop locally or visit the Zig-Zag website (www.zigzag.com) and contact them for a list of dealers online. Given the quality of their tubes and tobacco and the fact that their hand held small injector is among the best made, this kit should give the novice a very good sampling of what RYO is all about. The nicest kit as far as packaging goes is the Long's kit. Not only is the Danish tobacco contained therein very good and the injector first rate, the whole package comes in a really nice metal (tin) box that has usefulness beyond the duration of its contents. Makes for a very nice gift presentation and consequently is available at several tobacco outlets such as Ziggymart (www.ziggymart.com), or you can contact HJ Bailey (www.hjbailey.com) for a list of their clients who carry this fine kit. We're told that these kits are popular with brick and mortar merchants so don't hesitate to check for them at your local outlet. One of the best kit deals on the web right now can be found at RYO Tobacco ( www.ryotobacco.com ). It is the Brookfield Roll Your Own Kit. With the standard offerings of injector, tubes and some pretty good tobacco, you also get a metal cigarette carrying case that is pretty nice. What makes this deal so good is RYO's price of $11.95 for the whole thing. Republic Tobacco's TOP Cigarette Making Kit has all the standard features and components including its very popular tobacco, but like many of these kits, it is hard to find online. The good news is that you can find it now in many stores including general merchandise environments. Contact HJ Bailey (http://www.hjbailey.com) for a list of dealers. Finally the Sixty-One kit is available at Ziggymart and is a good deal espcially if you like the tobacco. The price is reasonable and the tobacco is sold at many outlets so should the recipient of this kit need refills, they need not be disappointed. 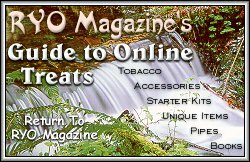 At the beginning of this page, we mentioned custom kits created by various online tobacco merchants. These usually revolve around higher quality injectors like the Supermatic or Excel, bulk tobacco which is less costly and often better quality - certainly with more variety - and various tubes by brand name manufacturers that one can experiment with to find a favorite or best buy. Kits in this category are more likely to satisfy the person who is really interested in switching from packaged cigarettes. Numerous online shops that we know of that market these kinds of generic kits are numerous so we will give you a list and let you explore to your heart's content. There are some new starter kits that are now available. We will look at them in the very near future. Many local shops have these kinds of assemblies so check your local dealer as well.